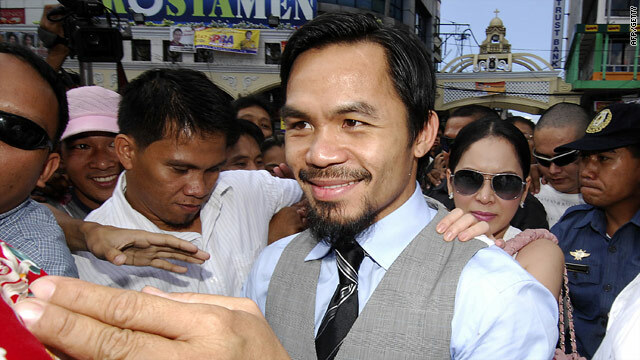 Pacquiao is mobbed by supporters as he campaigns in the Filipino elections. Manny Pacquiao hints at final professional bout against Floyd Mayweather Jr.
(CNN) -- Filipino boxing star Manny Pacquiao says he wants one final bout as a professional and it looks set to be an eagerly-awaited match-up against Floyd Mayweather Jr. later this year. National hero Pacquiao will enter the Philippine parliament after winning a seat in this week's elections, but has one more ambition to fulfil in the ring. "Many fans really want me to fight Floyd Mayweather so I asked my Mama if we can give them one more fight, she said okay," AFP quoted Pacquiao in an interview with broadcaster ABS-CBN. "We spoke yesterday and she said just one last fight, Mayweather." "Pacman" is rated by Ring magazine as the greatest pound-for-pound fighter on the planet after winning an unprecedented seven world titles at different weight divisions. Mayweather is unbeaten in 41 fights and is a huge draw at the box office, earning the nickname "Money" in amassing a fortune on his way to nine world titles in five different weight classes. The two were due to fight earlier this year, but negotiations ended acrimoniously with Pacquiao angered by the insistence of the Mayweather camp for Olympic style pre-fight drugs tests. It appeared to remain a major sticking point, along with Pacquiao's political ambitions and the influence of his mother Dionisia, who reportedly wants her son to retire from the ring. But with leading American promoter Bob Arum pulling the strings, visiting the Philippines to watch Pacquiao campaign for the election, the fight all boxing fans want to see could now be on. The Manila Standard newspaper reported that the Dallas Cowboys Stadium, where Pacquiao had his last fight against Joshua Clottey and the MGM Grand in Las Vegas, where Mayweather was last in action, had both been booked for November 13.